Over the weekend I ran into a neighbor who enthusiastically told me about how he was losing weight on a Medifast program. (Someone else in the neighborhood told him I was a weight loss doc and he wanted my opinion). I think he said he’d lost 28 pounds. I encouraged him to keep losing but pointed out that losing weight, especially for men, is usually easy in the beginning but successful weight maintenance can be very difficult. Afterwards, I thought about what I knew about Medifast. We’ve known about Medifast for years and have sampled their products many times, but have always rejected their protein products on three accounts: (1) inferior taste, (2) too much sugar carbohydrate, and (3) too expensive. The Medifast program is a non-medical commercial program that features a ‘low fat, nutritionally balanced reduced-calorie diet’ and ‘lifestyle counseling’ by non-professional staff – basically an outmoded program based on mid-twentieth century concepts now known to be fallacious. What concepts exactly? ‘Low fat, nutritionally balanced’ is code for high carbohydrate, protein deficient, essential fatty-acid deficient diet. Nutritional ‘experts’ may still extol low-fat diets but the majority of obesity medicine specialists now employ low carbohydrate diets that include an increased protein content. The same group incorporates lifestyle or behavior change counseling in the treatment mix but we recognize that this alone is insufficient treatment. The best programs now combine low-sugar carbohydrate diets, lifestyle counseling, and pharmacotherapy. Patients who are treated in such programs have greater initial weight loss, greater improvements in other health issues such as diabetes and high blood pressure, and much better rates of long-term success. Curious as to how our plan compared to that of the Medifast program, I made a quick visit to the National Library of Medicine and found two recent papers with results of patients treated with the Medifast progam. I compared their data with ours from a recently published report detailing results of our patients, and weight loss averages. A reasonable bit of advice from the National Institutes of Health is that before signing up for a weight loss program, one should investigate the program results. Of course one can ask program staff about results but the most reliable way to investigate is to look for published results since publication means knowledgeable experts or peers have reviewed the data. The table above shows peer-reviewed data from both programs. Interesting – our patients lose 2 times as much weight at 26 and 40 weeks and over three times as much at one year. Our patients’ weight loss (with a small amount of gain) persists at 2 and 5 years! Of course, these are averages of all patients weight loss – some patients lose a great deal more than the average and a few lose less but the comparison is valid. Our data on changes in average systolic blood pressure show that our average patient’s blood pressure at 40 weeks goes down by 15mm versus 8mm from the average Medifast patient. 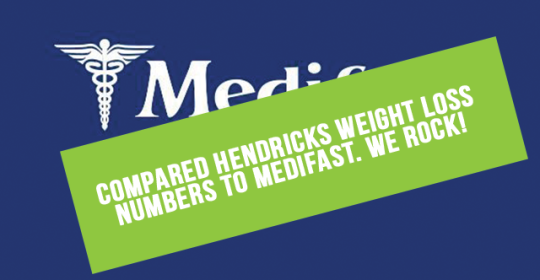 Why do our patients get results better than those on Medifast? Our patients do better because we offer a medical approach, add pharmacotherapy when warranted – a component that is omitted in the Medifast program. As a matter of fact, our published patient results are better than any other results for a medical non-surgical obesity treatment program published in the peer-reviewed medical literature. The next time you or a friend consider embarking on a weight loss program, we highly recommend you visit our office for a free consultation with our high qualified medical staff who are trained in Anti-Obesity Medicine, can monitor diabetes, hypertension, and your overall weight loss and health goals. 1. Davis LM, Coleman C, Kiel J, et al. Efficacy of a meal replacement diet plan compared to a food-based diet plan after a period of weight loss and weight maintenance: a randomized controlled trial. Nutr J. 2010;9:11. 2. Shikany JM, Thomas AS, Beasley TM, et al. Randomized controlled trial of the Medifast 5 & 1 Plan for weight loss. Int J Obes (Lond). 2013. 3. Hendricks EJ, Greenway FL, Westman EC, et al. Blood pressure and heart rate effects, weight loss and maintenance during long-term phentermine pharmacotherapy for obesity. Obesity (Silver Spring). 2011;19:2351-60. Valuable information. Fortunate me I found your web site accidentally, and I am surprised why this accident didn’t happened earlier! Glad you like it! Come back for more updated info!